Raise your hand if this is your everyday, go to, get it done pen. I expect more than a few hands will go up for the Zebra F-301 line of pens, and for good reason. These are exceptionally well made and great looking pens. For me, I have never quite gotten it with this pen, but it is not for lack of trying. What I love about this pen is its design. The sleek stainless steel barrel is great looking, and the barrel length and diameter both hit those just big enough sizes. The blue plastic in the grip and around the plunger really pop as well. But as great as it looks, it doesn't quite cut it in the performance department. The ballpoint ink is standard, and my definition these days of a standard ballpoint is any ballpoint pen that you would pick up that is just laying around. Something in the non-Jetstream category for sure. I have a feeling that the look and feel of this pen make the people who use it think that the ink actually performs better than it does. Does that make sense at all, or just in my head? More than the ballpoint, I really dislike the hard plastic grip. It is too firm and too slick for a pen that does require some pressure to write with. They may not be able to go with a full on squishy gel grip with the barrel diameter limitations, but almost any change in that area would be good. So, while I am at it, what else would I like to see? Would it be too much to ask for a Surari branded F-301? Make it happen Zebra! 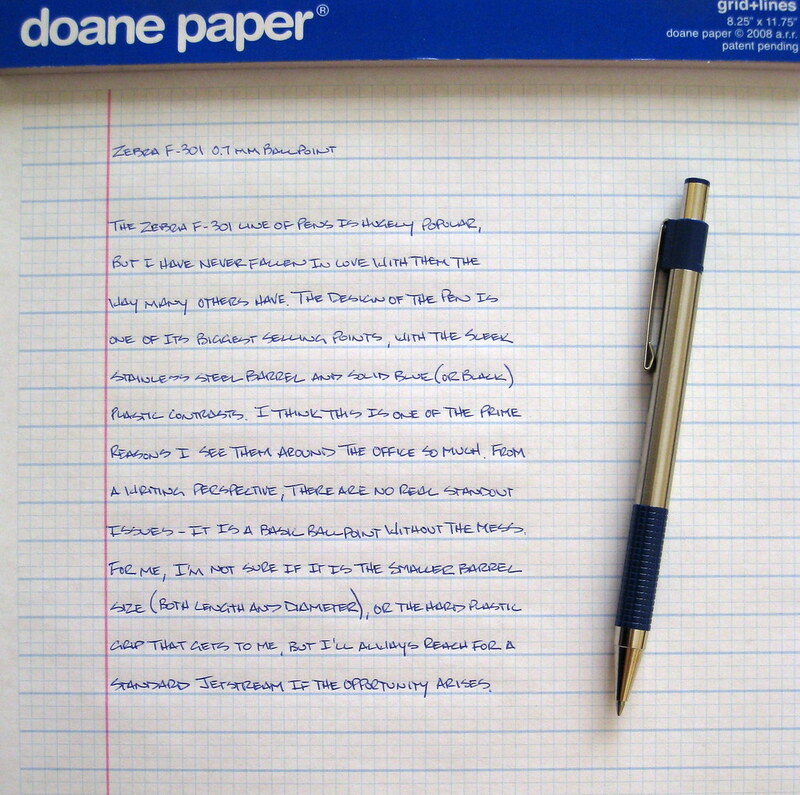 Posted on December 15, 2010 by Brad Dowdy and filed under Ballpoint, F-301, Pen Reviews, Zebra.